In the midst of enjoying the little kids’ excitement about the festivities and trading inside jokes, holiday gatherings are also an opportunity connect in an authentic way about the topics that really matter to one another. 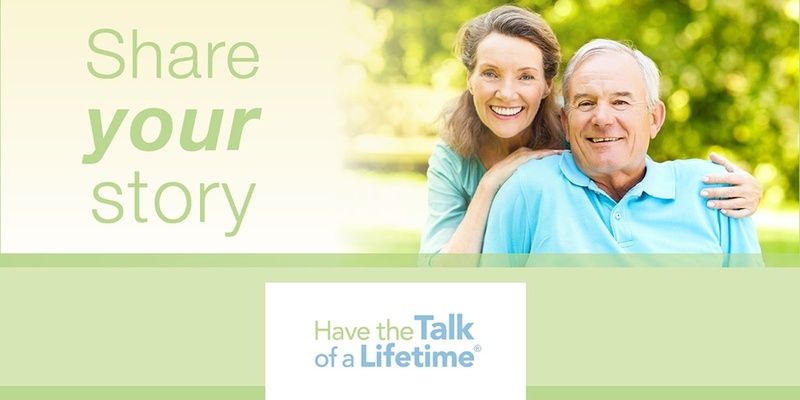 Getting started with these meaningful discussions can be the most difficult part, and I’m glad the Have the Talk of a Lifetime® program has provided a set of outstanding resources to make these conversations much easier. Here are five of my personal favorite tools, which you can share with your client families or incorporate into your own celebrations in the next few months. I’ve spent a lot of time on genealogy projects, exploring long-lost connections to distant family members that help put history in context for me. I have personally experienced how these projects can help bring loved ones closer together and bring up stories that otherwise might not have been shared. 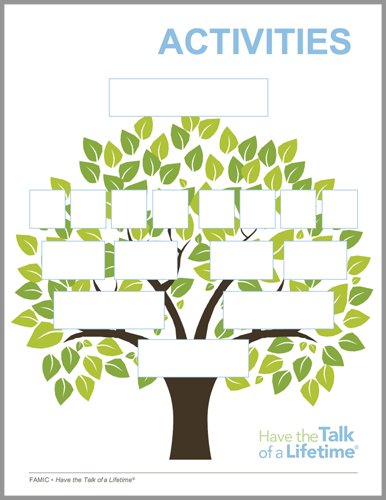 Have the Talk of a Lifetime® provides an activity that helps families start connecting the branches on their own family trees. The resource provides a simple way to get started by filling in boxes on a family tree graphic. With today’s sophisticated genealogy resources, the names of people in the first few generations are often enough to get started on exploring more distant connections through census, birth and death records. On the wall in my kitchen, there are two framed recipe cards – one with a favorite recipe from my mom, and the other featuring a favorite recipe from my mother-in-law. Food is inextricably linked to our family gatherings, and I wanted to honor those memories in the place where I do my own cooking. 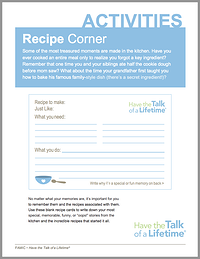 The Have the Talk of a Lifetime® program recognizes the connection between special dishes and family gatherings with their Recipe Corner Activity Guide, which you can download on the program’s website and share with your client families. The guide includes recipe card templates, and I love that it also provides prompts to share why those recipes are so special – something that you might not consider when using standard recipe cards. 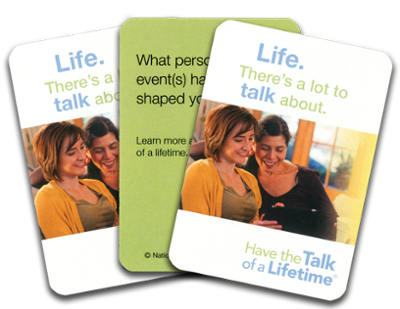 The Have the Talk of a Lifetime® cards have been a popular resource, earning positive feedback from funeral professionals and the families you serve. These cards took on even more significance for Homesteaders employees who participated in our Have the Talk of a Lifetime conversation card video series. We brought in employees’ family members for conversations based on the cards’ questions, demonstrating just how meaningful this activity can be. The 50-card deck features questions about many different topics, ranging from school memories to holiday traditions and favorite music. Consider keeping a deck of the cards in your bag or in your car, especially during the holiday season when gatherings are frequent – you never know when you may have an opportunity to learn more about the people in your life. The Have the Talk of a Lifetime® Workbook directly addresses both of those questions in an approachable way. 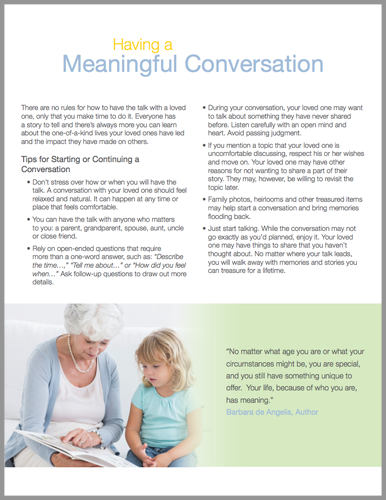 It includes helpful hints for starting (or continuing) a conversation with loved ones, as well as additional topic prompts that can help guide the discussion. The workbook also provides space where you can write down notes about some of the topics that you and your loved one discussed. Every year, one of the first things to go on our Christmas tree is a set of small Santa ornaments. I bought them during one of the first Christmases my husband and I shared together. They’re a little silly and, objectively, probably also a little tacky. But we look forward to putting them out because they remind us of those early years and make us smile when we unpack them from their box. New family traditions, no matter how small, have the potential to become part of the memories you build together. Creating new traditions can help involve younger family members and, if you’ve recently lost a loved one, help you remember those who were an important part of your existing family traditions. 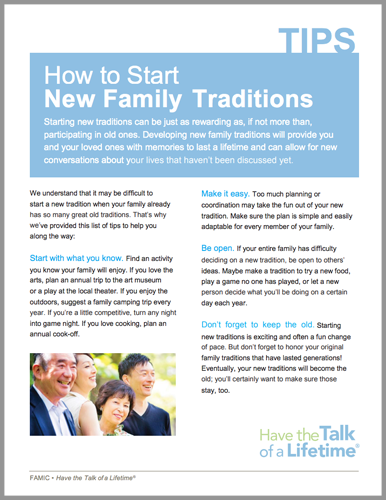 The New Family Traditions Activity Guide can help facilitate this process, providing tips for starting new traditions and integrating them into your old ones. Have you heard success stories from your client families who have used these or other Have the Talk of a Lifetime® resources? Have you tried any of them with your own family members yet? Share your experiences in the comments below.